The day I was to solo fell on Friday the 13th. I figured I had best fly now, rather than wait for Halloween. I have often heard people speaking of perfect flights and greased landings on their solos... For some reason I don't seem to do things like that. My solo flight was a progression of errors and bone head moves that I survived as a tribute to the excellent design of my plane and superb training. It was a crystalline windless Arizona morning... I started with some high speed taxi practice. On the third run I developed a major oscillation. Swinging wildly first left, then to the right. Losing control I left the runway at a right angle and shot across the desert until my wheels jammed in a drainage ditch at the foot of a berm. Tail went up, the nose went down and thumped the berm. The plane bounced back onto its tailwheel. "Great... I haven't gotten off the ground and I logged my first groundloop..."
Grabbing the tailboom I drag the plane back to the runway. I come to the conclusion that high speed taxi practice is one of the most dangerous things you can do with your airplane. Racing down the runway at near take off speeds in a squirrelly 250 lb. aircraft is just gonna have to wait until I can fly it better. At 100 ft. 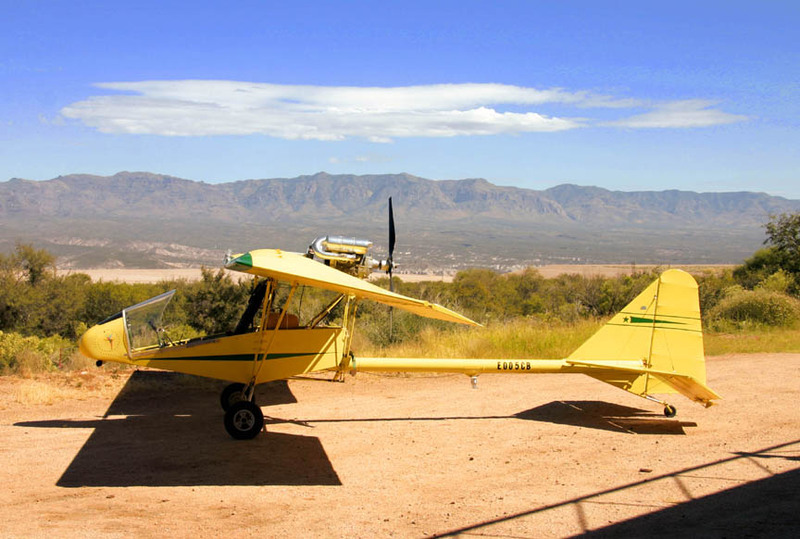 I remember how profoundly acrophobic I am… My training was in a Cessna-150 and an Rans S-14. Both aircraft were fully enclosed (and came complete, with an instructor who knew how to fly it...). The Firefly gives "open cockpit" a whole new meaning (the factory calls it "Unparalleled Visibility") and it was terrifying. I could see from my side vision I was drifting closer to two 500 ft. smoke stacks a half a mile past the end of the runway. At this point I made about my only right decision of the entire flight... I stuck to my preflight plan... I turned to the left, pointed the nose up and picked up a thousand feet of altitude to get away from anything I could run into... I got to a practice area and flew back and forth, round and round, turns over a point, cut back the power to feel it sink... I got up the nerve to look over the side. But I couldn't bring myself to stall the plane. Turning towards the airport I managed to scoot around on the seat cushion so that it pushed the trim tab handle full forward, pitching the nose sharply down (I believe that this smooth move also shut off one of the two ignition switches which are located nearby. (saved by redundancy))... With the nose pointing down there's panic at the helm. I get the trim pulled back, start flying straight and level again, and enter the pattern to land. Flying the pattern is reassuring... Maybe I'll make it... Naa, not a chance... I turn to final, everything looks good. I put in a notch of flaps, pull back on the power a bit, drop in the last of the flaps and we slow way down. To keep airspeed I have to push the nose way over. I feel like I'm standing on the pegs. To make the end of the field, belatedly, I give her some power. Pulling back on the stick I round-out hot and late... I get a good enough bounce off the runway that I'm gonna log two landings. My post flight inspection revealed I had managed to turn down my headset so that I heard no one and no one heard me. Also, it was at this inspection I discovered I had turned off one of the two ignition switches and I had picked up a small branch in my tail rigging (acquired at takeoff, I'm sure).